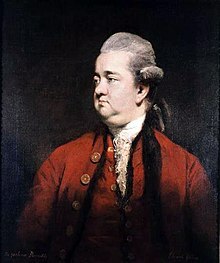 Edward Gibbon (1737-05-08 [or 1737-04-27, O.S.] – 1794-01-16) was arguably the most important historian since the time of the ancient Roman Tacitus. Gibbon's magnum opus, The History of the Decline and Fall of the Roman Empire, published between 1776 and 1788, is a groundbreaking work of early modern erudition, the broad influence of which endures to this day. The superstition of the people was not embittered by any mixture of theological rancour; nor was it confined by the chains of any speculative system. The devout polytheist, though fondly attached to his national rites, admitted with implicit faith the different religions of the earth. Fear, gratitude, and curiosity, a dream or an omen, a singular disorder, or a distant journey, perpetually disposed him to multiply the articles of his belief, and to enlarge the list of his protectors. The thin texture of the Pagan mythology was interwoven with various but not discordant materials. Volume 1, Chapter 2 "Of the Union and Internal Prosperity of the Roman Empire, in the Age of the Antonines". The portion regarding the views of the religions of the time taken by various constituencies has been misreported as Gibbon's own assessment of religion generally. See Paul F. Boller, John George, They Never Said It: A Book of Fake Quotes, Misquotes, and Misleading Attributions (1990), pp. 34–35. The bold text has been misattributed to Lucretius and Seneca the Younger. Vol. 1, Ch. 3 "Of the Constitution of the Roman Empire, in the Age of the Antonines"
Vol. 1, Chap. 3. Compare: "L'histoire n'est que le tableau des crimes et des malheurs" (translated: "History is but the record of crimes and misfortunes"), Voltaire, L'Ingénu, chap. x.
Wit and valor are qualities that are more easily ascertained than virtue, or the love of wisdom. Vol. 1, Chap. 14. Compare: "Amiable weakness", Henry Fielding, Tom Jones, Book x, Chapter viii. Vol. 1, Chap. 48. Compare: "He had a head to contrive, a tongue to persuade, and a hand to execute any mischief", Edward Hyde, 1st Earl of Clarendon (on Hampden), History of the Rebellion, Vol. iii, Book vii, Section 84.
ingratitude was published to his subjects, in an edict which prohibited the senators from exercising any military employment, and even from approaching the camps of the legions. But his fears were groundless. The rich and luxurious nobles, sinking into their natural character, accepted, as a favor, this disgraceful exemption from military service; and as long as they were indulged in the enjoyment of their baths, their theatres, and their villas, they cheerfully resigned the more dangerous cares of empire to the rough hands of peasants and soldiers. It is difficult to paint the light, the various, the inconstant character of Gallienus, which he displayed without constraint, as soon as he became sole possessor of the empire. There were, however, a few short moments in the life of Gallienus, when, exasperated by some recent injury, he suddenly appeared the intrepid soldier and the cruel tyrant; till, satiated with blood, or fatigued by resistance, he insensibly sunk into the natural mildness and indolence of his character. In every art that he attempted, his lively genius enabled him to succeed; and as his genius was destitute of judgment, he attempted every art, except the important ones of war and government. He was a master of several curious, but useless sciences, a ready orator, an elegant poet, a skilful gardener, an excellent cook, and most contemptible prince... There were, however, a few short moments in the life of Gallienus, when, exasperated by some recent injury, he suddenly appeared the intrepid soldier and the cruel tyrant; till, satiated with blood, or fatigued by resistance, he insensibly sunk into the natural mildness and indolence of his character. Our habits of thinking so fondly connect the order of the universe with the fate of man, that this gloomy period of history has been decorated with inundations, earthquakes, uncommon meteors, preternatural darkness, and a crowd of prodigies fictitious or exaggerated. In a distant age and climate the tragic scene of the death of Hussyn will awaken the sympathy of the coldest reader. EGPaIV" Edward Gibbon, , Decline and Fall of the Roman Empire, Vol. 5, Chapter L: Description Of Arabia And Its Inhabitants. Part IV. Vol. i. p. 106. Compare: "None ever loved but at first sight they loved", George Chapman, The Blind Beggar of Alexandria. It was at Rome, on the fifteenth of October 1764, as I sat musing amidst the ruins of the Capitol, while the barefoot friars were singing vespers in the Temple of Jupiter, that the idea of writing the decline and fall of the city first started to my mind. Vol. i. p. 117. Compare: "Never less alone than when alone", Samuel Rogers, Human Life; "In solitude, where we are least alone", Lord Byron, Childe Harold's Pilgrimage, Canto III, Stanza 90. In the end, more than freedom, they wanted security. They wanted a comfortable life, and they lost it all – security, comfort, and freedom. When the Athenians finally wanted not to give to society but for society to give to them, when the freedom they wished for most was freedom from responsibility, then Athens ceased to be free and was never free again. The italicized passage above originated with Thatcher. In characterizing the Athenians in the article she cited Sir Edward Gibbon, but she seems to have been paraphrasing statements in "Athens' Failure," a chapter of classicist Edith Hamilton's book The Echo of Greece (1957), pp. 47–48). ...it is impossible, through reading alone, to interpret the past. Nor is emotion enough. The historian must have a third quality as well: some conception of how men who are not historians behave. Otherwise he will move in a world of the dead. He can only gain that conception through personal experience, and he can only use his personal experiences when he is a genius. In Gibbon, as in no other English historian, this tenuous circle was complete. He was a genius who read, dreamed, and also knew — knew, by direct contact, a fragment of the rough stuff of society, and extended his knowledge through the ages. E. M. Forster, "Captain Edward Gibbon", (1931) in Abinger Harvest, E. Arnold & Co.: London, 1936. The Oxford edition of Gibbon consists of eight volumes with four or five hundred pages in each volume. The exact number of pages is 3,860. The fondest admirers of Gibbon cannot say that it is light reading. Evening after evening goes by, and, if the reader is conscientious, and does not skip, it is a long time before the work is read. Indeed, in these degenerate days I doubt whether there are many persons in the world who can say that they have read their Gibbon right through. Sir Arthur Helps, in Brevia: Short Essays and Aphorisms. Boston: Roberts Brothers. 1871. pp. 116–117. Attributed to Prince William Henry, Duke of Gloucester and Edinburgh, 1781, upon receiving the second (or third, or possibly both) volume(s) of The History of the Decline and Fall of the Roman Empire from the author. quoted by Sir Leslie Stephen in the Dictionary of National Biography, (1921), vol. 21, p. 1133. Gibbon was not interested in religious doctrine, though he amused himself with its speculative refinements. But religion and Churches, he would admit, are a social and psychological necessity, and the particular forms which they take are important, for they can influence the progress or decline of civilization. Therefore the historical question he asked was, did the ideas of Christianity and the organization of the Church, as adapted to the Roman Empire, generate or stifle public spirit, freedom, and the advancement of knowledge and a plural society. His answer was that they stifled it. If Christianity had first been established in independent city-states like those of Greece, perhaps it would have assumed a different and more useful form – as it eventually did in the communes of Italy and, more successfully, in the Protestant cities of Switzerland. But the very fact of its establishment by imperial power, as an ideological support to that power, made it subservient to a centralized, monopolist system whose organization and absolutism, in its own formative period, it imitated and sustained.